Living in the Texas Panhandle has taught me a lot about planning and flexibility. For the record, I grew up living in rural South Dakota and have also had the pleasure of living in southwest Kansas for a summer. I understood that "going to town" generally meant 20 plus miles of driving, but the Texas Panhandle is a little bit different. Monday through Friday, "going to town" usually means going to Pampa. Pampa is a 25-minute drive, and we have access to a great grocery store, a Super Walmart, and a couple of restaurants (well, more than a couple, but some I'm not brave enough to try). On a weeknight we decide to "go out," you'll find us at Mojo's, a sports bar. It is the only establishment in Pampa where we can drink and eat in the "pub" type of atmosphere. The service isn't always the best, but we don't have much for options. Plus they have five dollar pitchers most nights of the week. That's a deal! On the weekends, "going to town" means going to Amarillo, where we can choose from a selection of nice restaurants, shop for clothes, find a decent nightlife, go to the movies, etc. The drive to Amarillo is about an hour so it is generally not a spur-of-the-moment decision to go to town. For example, I have been planning to go to AMA today for an appointment for over a month. Royce has been planning on going with me since Wednesday when he found out about a Farm Bureau event. That, my friends, is planning at its finest for my husband! Another challenge of living an hour from where we "go out" at night is the discussion of who is going to drive home. Oh and the fact that if we close down the bar at 2 a.m., we won't get home until at least 3 a.m. That creates havoc on my sleep schedule, and it also makes it fairly challenging to get to church in the morning. Let's just say that closing down the bar doesn't happen much when you live in the middle-of-nowhere. Living out in the country on dirt roads can create a few more challenges. For one, if it rains a bunch, our road is nearly impassable unless you have 4-wheel drive. If it has rained a lot, your usual route to town (as in Amarillo) is replaced by the 15-minute longer route that gets you to pavement a quickly as possible (which is still 4 miles, mind you). Rain makes it really fun when you are planning to have friends out for dinner as well. "Well, it rained a little so you should take O'Neal Road to West Line Road then jump down to Davis Road." OR "It monsooned here. I'll need you to park your car at the farm (2 miles from our house). We'll bring the pickup to come get you." When you live in the Panhandle, it is no longer a "run to the grocery store" situation. Before you start making that meal, you probably should make sure you have all the ingredients because if you don't, it'll be over an hour to go get the missing ingredient. That's where planning comes in. I've learned to either plan for something to cook or at least make sure we have a quick meal to whip up just in case. I've learned to plan my appointments in AMA for the same day, and if they aren't available on Saturday, I can plan to take at least a half day off of work. Flexibility. There is nothing that will teach you to be flexible with your plans more than when it rains and your route home has to change, even though you really need to be back by this time! Muddy roads are also good for another thing: teaching your friends to invite you to their house instead of your own if they don't want to wait for us to pick them up. 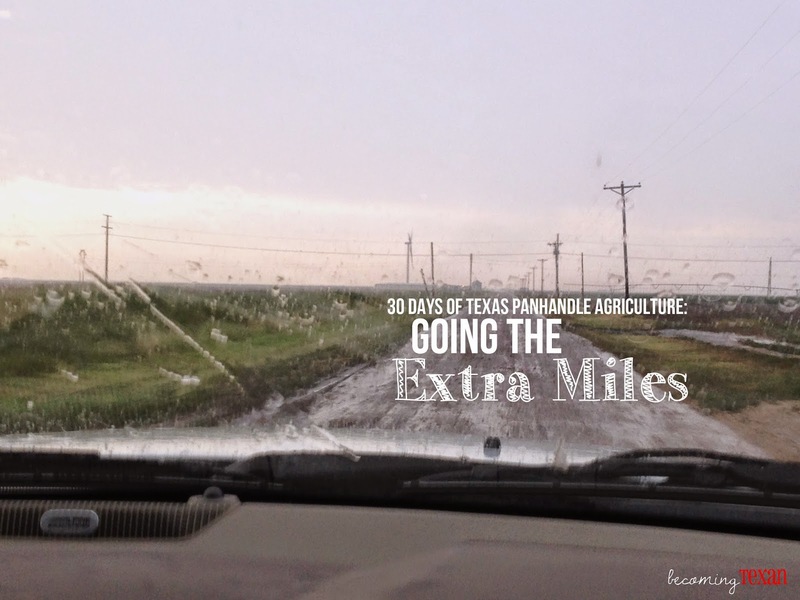 This is the 20th day (posted on the 22nd day of November) of my 30 Days of Texas Panhandle Agriculture series. To read more, please visit this introduction post. If you have questions or ideas you'd like me to write about concerning Texas Panhandle agriculture, I'd love to hear from you!